How to get there: A good starting point is the small town of Stryn. Stryn is located at the end of the fjord Nordfjord on Norway's west coast. 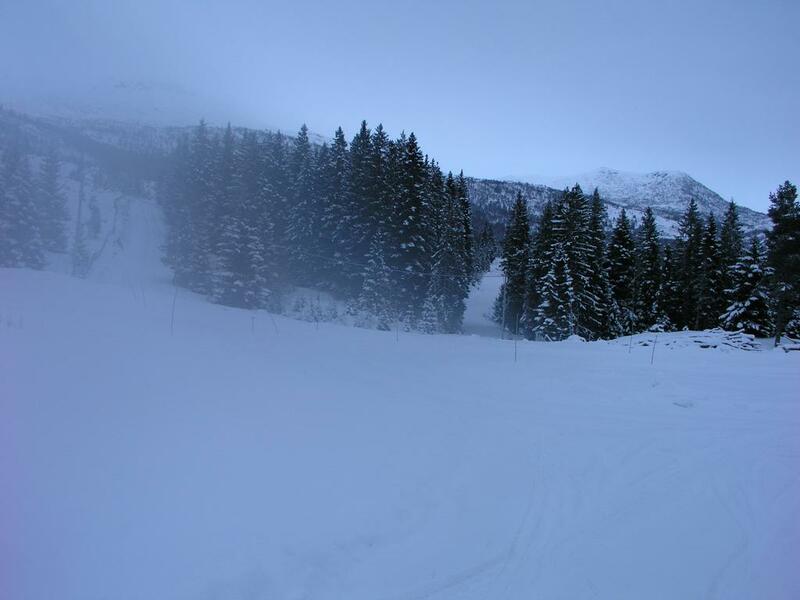 Stryn can be accessed across Strynefjellet from the east or from Bergen (approximately 5 hours drive) from the south. From Stryn, drive west on the north side of Nordfjord towards Nordfjordeid, after about 10 km there is a road going left, the sign reads Hopland. Take this road and follow it more than 20 km to the small farm community Randabygda. There is a sign at a road turning right for "Sportsanlegg" (sports facility). This road also serves the farm Åland. Follow this road, first across the creek, then sharply right and steeper uphill at the farm to the beginning of a lighted, groomed cross country track. There is parking to the left near a building associated with the sports facility. My GPS showed an elevation of 397 meter, consistent with a map reading of about 400 meter. Route description: This mountain can be climbed along several alternative routes, this description works well in winter under good as well as less favorable conditions. From the parking area, you will se the mountain right uphill, while two easily identifiable tracks (since the trees have been cleared away) leads from the parking area further to the right. Take the right one (the one which is the most level) and that has a groomed, lighted cross country ski track in winter. The other route is a gentle uphill, while this one actually starts with a very small downhill. See the picture below that clearly shows this area and the two routes. Before heading out, look at the terrain from the parking area. Following the direction of the cross country track, you will see some lower mountains in the distance, your route will head over in that direction and climb a gentle valley between the big mountain Glitregga and those lower hills. Head out the cross country track and follow it as it crosses a creek (distinct, short downhill followed by a small uphill). Soon thereafter, the track turns right and heads downhill. Do not follow it any longer, but continue straight ahead across some meadows and through some minor vegetation. Your route will cross another small creek and should stay at approximately the same elevation. Soon, you will hit the summer road marked on the M711 map that services the summer farm (sæter) called Randastøylen. Follow this road to the huts and small farm buildings and continue uphill in the same general direction into the small valley called Fagredalen between the summit and the smaller peak to your right called Høgefjellet (867 m). This valley continues upward, there is a small lake and a cabin on your right as you gain a rather flat saddle area near the top. From this area, you have Blåegga (1055 m) right ahead, while there is a narrow but distinct valley, named Holmøyskardet climbing up between Glitregga and Blåegga. Climb this valley until the terrain starts leveling out after about 50 vertical meters near a first small lake and consider the area around you. In front, the terrain is almost flat to the saddle between Blåegga (on your right) and Glitregga up to your left. Directly to your left, there is a gentle access to Glitregga, while the terrain further ahead looks more complicated. Turn left and climb this tiny valley until reaching a flat plateau with a few cairns on it. Ascend further in an arc turning right, then more left as you gain the general east main south-east ridge of Glitregga. This ridge is not distinct, but a general slope heading NW. Follow the general main ridge, possibly a bit on the north side the rest of the way to the summit. Descend your ascent route. Under good conditions and clear visibility there are several more direct routes that may be used for a shorter and steeper ski descent back to the parking area. 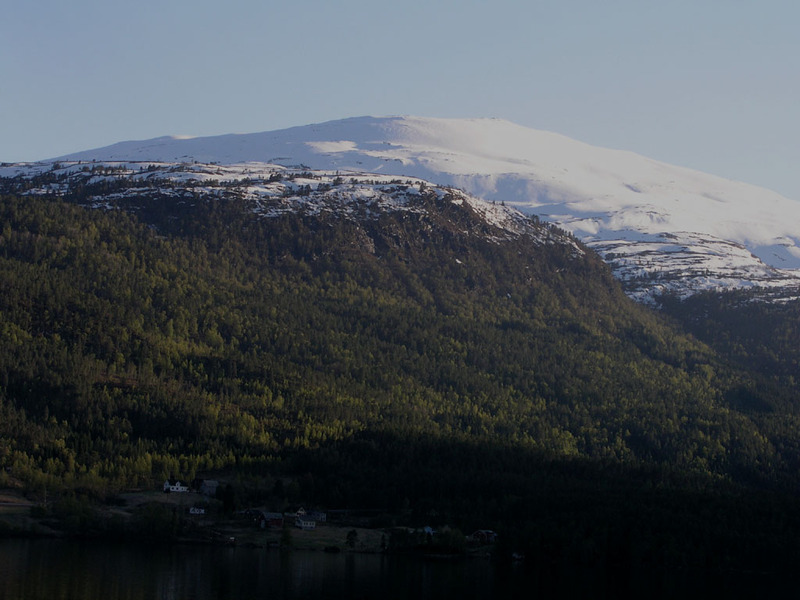 Comments: This mountain is between the lake Hornindalsvatnet (north) and the fjord Nordfjord (south). Hornindalsvatnet is Europe's deepest lake, 514 meter deep. Since this lake is about 50 meter above sea level and since the fjord is also more than 500 meter deep, Glitregga rises almost 1800 vertical meter from its base on two opposite sides. I did this climb with Arnt Flatmo. We started out at 0900, made the summit around 1300 and returned to the car at 1500. We were visitors number 17 and 18 in a new guestbook at the summit, the previous visit being in the first half of October 2002. We had pretty bad conditions with extremely limited visibility higher on the mountain. Flat light where the snow surface and the air cannot be separated. I skied straight off a small cornice while decsending, safe here, but such conditions are potentially very dangerous in more complicated terrain. Glitregga, as seen from Eidskyrkja (in front, the view is south). Glitregga, (left) as seen from the west end of lake Hornindalsvatnet. Glitregga, as seen from the east end of lake Hornindalsvatnet. The trailhead. We started out along the groomed track to the right. The route contours left into the valley just in front of the mountain that is visible in the background.